"As described by Milton Osborne, who has known it for 50 years, Phnom Penh does so deserve first-rank writing." Forever linked in the public mind with the Pol Pot tyranny, Phnom Penh only became Cambodia’s permanent capital in 1866. Long neglected by Western travellers, in the sixteenth century it was home to Iberian missionaries and freebooters who briefly held Cambodia’s fate in their hands. It faded in significance until France established a colonial protectorate over Cambodia in 1863. As the colonialists robbed the Cambodian king of his temporal power, their protection enhanced his symbolic importance, setting the scene for the emergence of one of the most intriguing rulers of the twentieth century, King Norodom Sihanouk. The city Sihanouk ruled from 1941 to 1970 was a mix of traditional palaces, Buddhist temples and transplanted French architecture. In the 1960s Phnom Penh deserved its reputation as the most attractive city in Southeast Asia. But after 1970 all this was to change, and a terrible civil war was followed by the Khmer Rouge’s capture of the city in 1975. Since the defeat of Pol Pot in 1979, Phnom Penh has slowly recovered, once again attracting perceptive travellers. CITY OF ROYALTY AND COLONIZERS: Kings, courts and battles with French administrators; royal ceremonies, dancers and elephants; foreign intrigue and carpetbaggers who sought and failed to find riches. CITY OF CULTURE: A rich local culture that became a headache for French officials; traditional architecture and colonial buildings that remain today; notable literary visitors from Somerset Maugham to André Malraux. CITY OF EVIL AND REBIRTH: The terrible rule of Pol Pot; the Tuol Sleng extermination centre where 17,000 men, women and children were tortured and killed as “enemies of the state”; the return to a fragile normality. 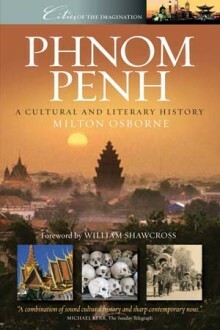 MILTON OSBORNE first lived in Phnom Penh in 1959-61 and has continued to return regularly to the city. The author of nine books on the history and politics of Southeast Asia, he is an Adjunct Professor in the Faculty of Asian Studies at the Australian National University, Canberra.